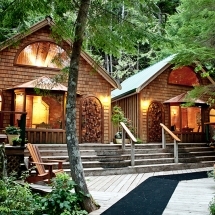 The Great Bear Rainforest provides the setting for this luxury cabin holiday in BC, Canada. 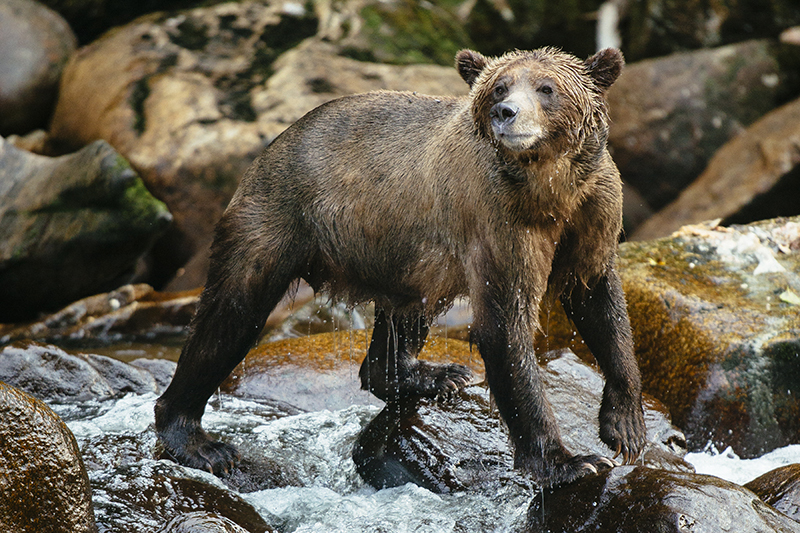 This area is home to an abundance of wildlife including the Black Bear, Grizzly Bear, whales, salmon and wolves. 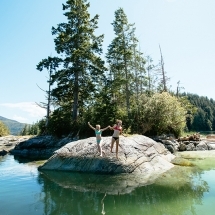 Tucked away at the edge of a coastal inlet with thin the protected rainforest area, Nimmo Bay Resort offers a luxurious retreat with access to unlimited nature and lush wilderness. Six intertidal cabins perch at the shoreline allowing guests to experience the rise and fall of the water beneath them, whilst three cabins are hidden away streamside with the sound of cascading waterfalls close by. 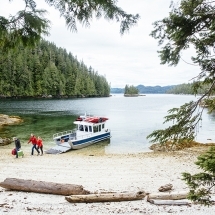 From arrival by float plane to departure day, the resort staff offer a end-to-end service tailoring your wilderness adventures to your exact requirements. This holiday includes a daily menu of options to choose from as well as the chance to indulge in wellness activities and enjoy five star cuisine. Connections from Vancouver bring you to Port Hardy Airport where your hosts from Nimmo Bay will meet you. 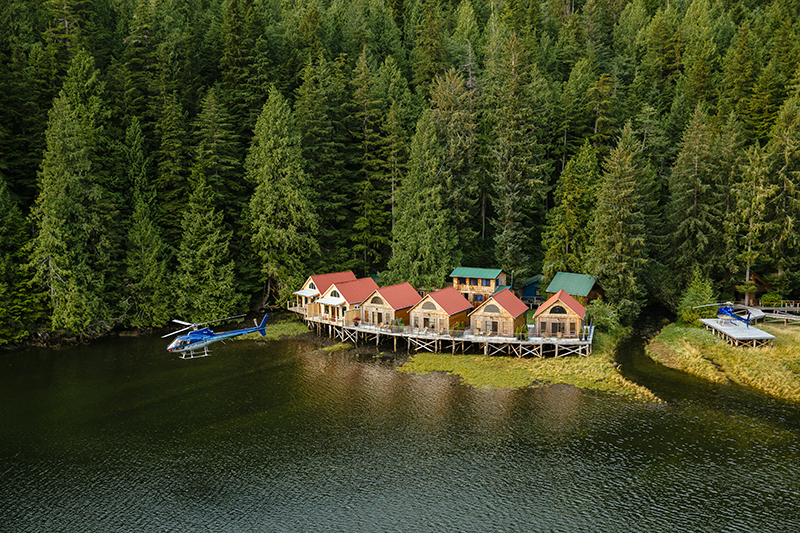 An evening departure by float plane lifts you high above the rainforest and touches down in a perfect paradise. Take some time to take in your surroundings and settle into your cabin. Hors d’oeuvres and beverages are served on the deck side lounge and floating lodge. A gourmet 3 course coastal feast and house-made decadent dessert will soon follow. 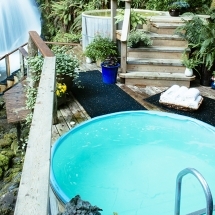 After dinner, enjoy a waterfall hot tub, a billiards game, a massage or relax around the floating moonlit fire pit. 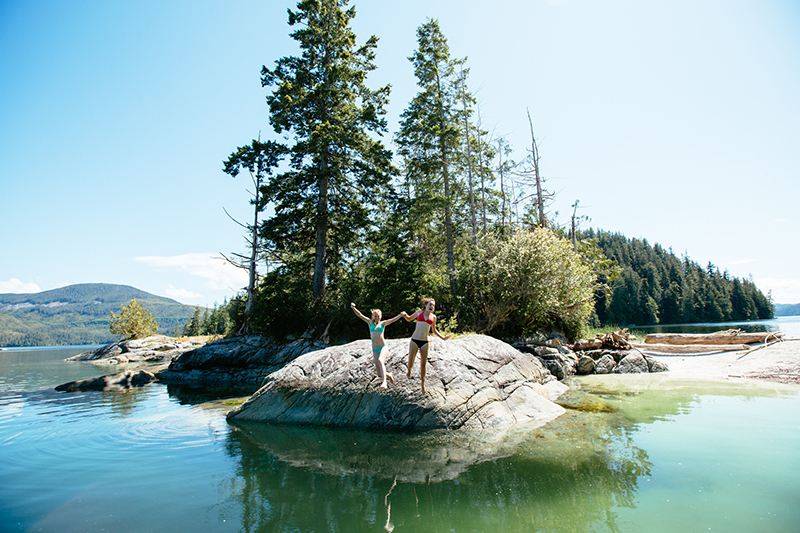 The magical location of Nimmo Bay brings a little tropical paradise to a temperate Northern Clime. Its verdant surroundings are a haven for nature and wildlife lovers and the full service lodge is at your beck and call to ensure a memorable stay. 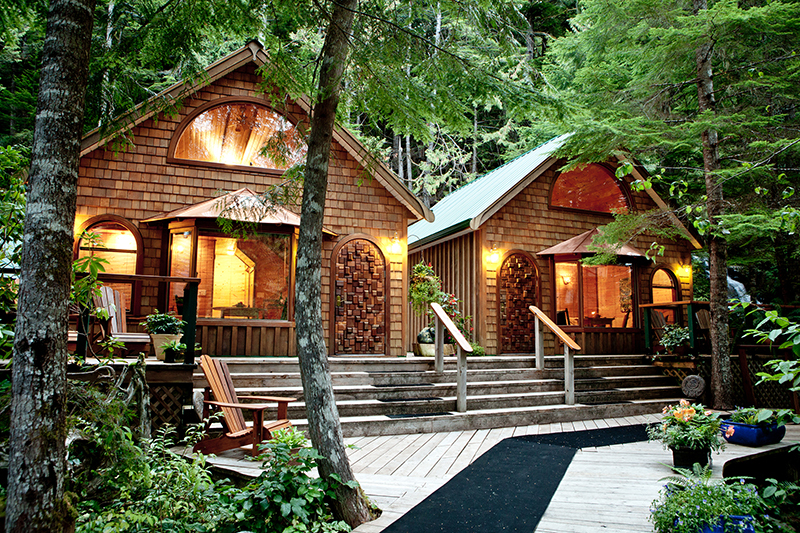 Nine spacious and cosy cabins place you in the heart of the rainforest. The intertidal cabins have red-peaked roofs and allow you to experience the rise and fall of the tide right beneath you. These four-room units have a comfortable living area, a washroom and two bedrooms, each with a queen-sized bed. 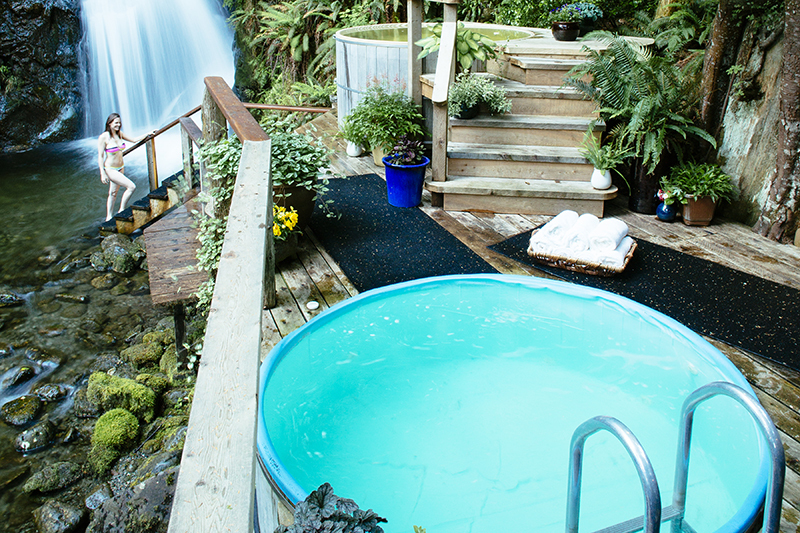 In the green-peaked streamside cabins, you will fall asleep to the sounds of the nearby cascading waterfall. Perfect for a family, these units have a pleasant living area, a single washroom and two bedrooms; one with a queen size bed and one with a pair of single beds. 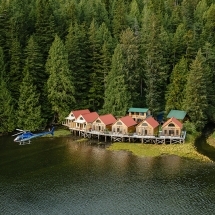 Each cabin includes house made cookies and truffles, Mission Hill red and white wine, complimentary mini bar of juices, pops and beer (special requests are always granted), selection of specialty teas, Starbucks VIA coffee machine, kettle, cotton robes, feather or non-allergenic pillows, full sized sectional couch, outdoor seating area, Egyptian cotton bedding, a Nimmo Bay stainless steal water bottle (for each guest to take home), Crocs footwear, Bose IPOD dock and stereo, umbrellas, daily housekeeping, turndown service, hair dryer, daily supply of fresh towels (if needed), organic bath and beauty products, pillow top mattresses and living room area. Your day begins as actively or as decadently as the mood takes you. 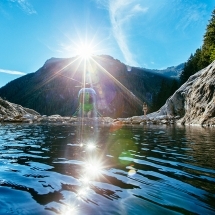 An early morning yoga class is offered to awaken the body and mind, or perhaps a relaxing dip in the outdoor hot tub followed by a balancing outdoor rain shower. Or simply enjoy the chance to sleep and let the aromas of homemade cinnamon buns and organic Fernwood coffee awaken you. A three course breakfast is served in the floating lodge which includes a fresh-squeezed juice bar, healthy smoothies and infused waters. Your hosts will help to devise an adventure plan for today based on your preferred activities (please see the list below right). After a day enjoying the surroundings, evening treats await. Cocktails are served on the floating fire deck followed by a coastal appetizer and four-course gourmet dinner and mouth watering, in-house-made dessert. All breads and pastries are made fresh on site. 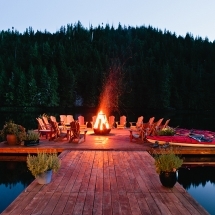 After dinner, return to the floating fire dock to relax beneath skies of intense starlight. Enjoy an after dinner drink while you are serenaded by that evening's musical offering. 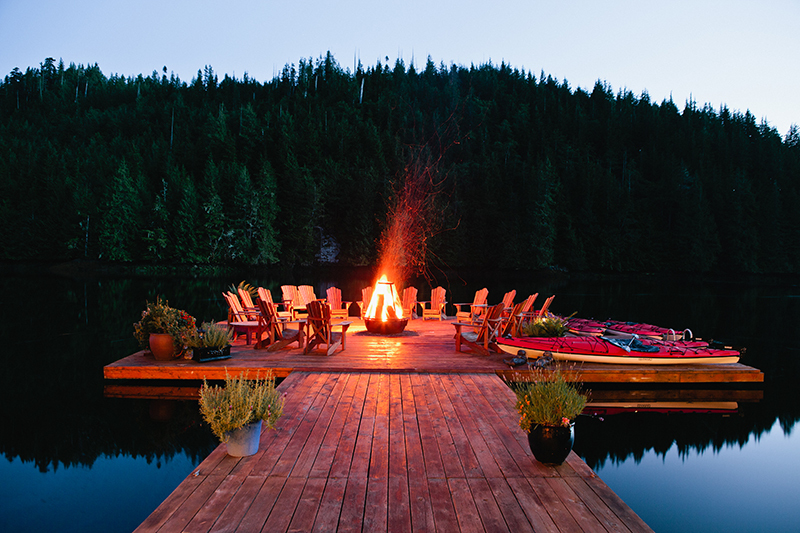 You may also enjoy an evening kayak to see the glowing phosphorescence light up the pitch black night, take another waterfall hot tub, or retire to your own personal intertidal chalet for a deep restorative sleep. Today will offer the opportunity to choose an adventure from the list made available. 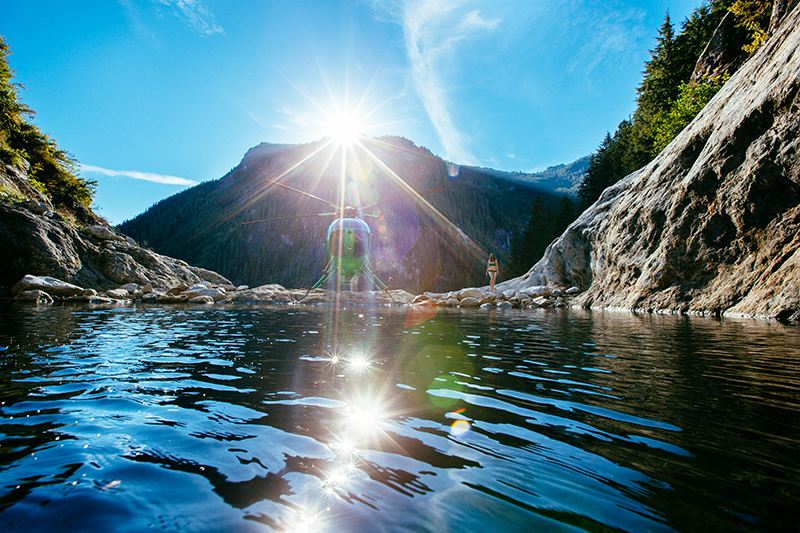 The resort also has a fleet of helicopters for once-in-a-lifetime adventures in the high mountains and glaciers. There is a supplementary cost to book a helicopter tour, and indeed we can arrange packages with daily helicopter adventures including heli-hiking, heli-rafting and heli-fishing. All adventures are subject to suitable weather conditions, and we cannot guarantee the order of the final itinerary as this will be confirmed on arrival at the resort. Enjoy your final evening to relax and take in the special atmosphere which you will want to bottle and take home with you! 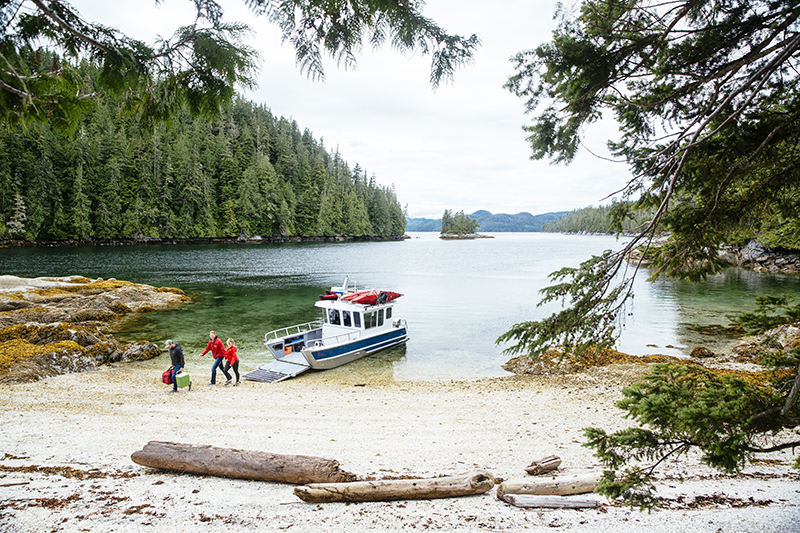 After a final breakfast, it is time to depart from Nimmo Bay and return to Port Hardy for your onward travels. If you’re hankering for a longer stay, we can arrange four and seven night packages based on set arrival and departure days. We can also extend your holiday with a self-drive package in BC and Vancouver. Please get in touch with us to find out more. 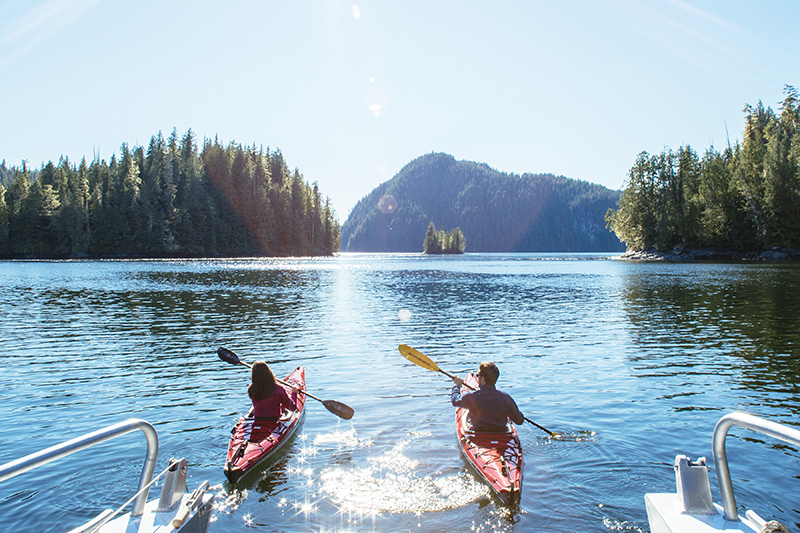 Kayaking Day Trip: Head out to the Broughton Archipelago's remote islands and explore this unique part of the BC coast. Whale Watching: Take a 25min open Zodiac boat trip to where the whales feed. Watch in awe as the playful Orcas and Humpbacks put on an exciting show. 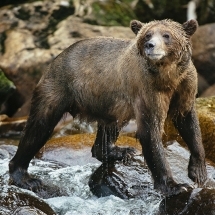 Bear Watching: Take a 45min open Zodiac boat trip to watch black and grizzly bears fish for salmon as they run up the river to spawn. Waterfall Tours: Tour around in a 38ft fully enclosed aluminum hull boat and discover the plentiful and massive waterfalls as they crash right into the ocean. Ocean Fishing: Bottom fish for halibut, troll for ocean salmon, drop a line in the kelp to catch a Ling Cod. On Water and Land: Take a boat to one of the surrounding inlets, head out for a hike, discover a hidden lake, maybe even go for a wild swim. Cultural Museum Visits: Delve into local culture as you learn the history of the Great Bear Rain Forest and its people. 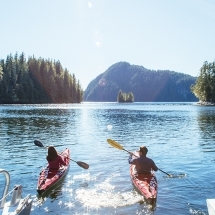 From £3990 per person (based on two travelling) excluding flights to Vancouver. Children's prices are available and this break is suitable for families. This holiday is available from May until end of October. Black bear viewing is possible from May until October, Grizzly bear viewing is possible between end of July and end of October, whale viewing is possible between July and October. Wildlife viewings are not guaranteed.